The long-running TV series “Cheers” features the bar as a character in its own right, the bar where everybody knows your name. Many of us would be overjoyed to meet almost daily in a place so friendly, but there is a limit. If everybody knows your name, that’s fine. But would you like everybody to know everything about you? This is the situation in Torrelaguna, an autonomous region of Spain’s Madrid community where Asghar Farhadi’s latest film was photographed. It has the small-town ambiance despite its proximity to the nation’s capital, a fair-sized segment of land given over to a vineyard which is co-owned by Paco (Javier Bardem), a gentleman who will figure greatly in the plot. 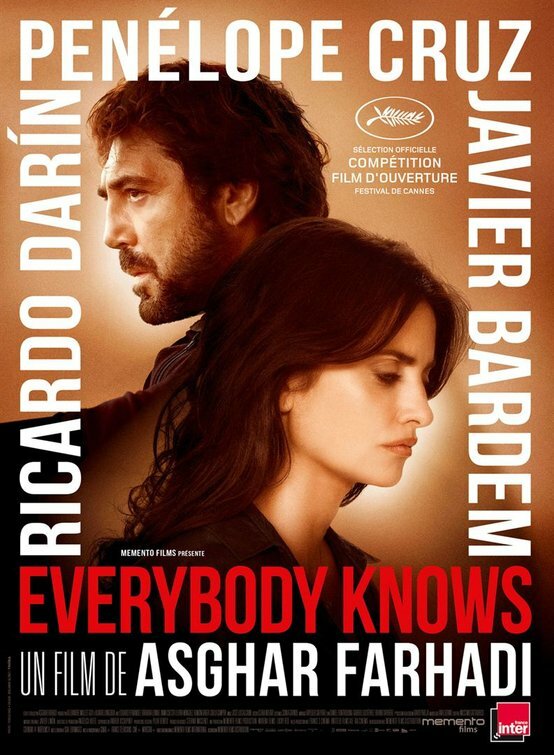 “Everybody Knows” is the first movie in Spanish from the Iranian director. Farhadi, whose principal work in my opinion is “A Separation”—about whether a couple will provide a better life for their child by moving out of Iran or whether they should stay in their home country to treat a father with dementia—this time focuses on a large community involving an extended family, groups of neighbors, and an assortment of grade pickers working in a vineyard. At first, the film could be taken as a lively documentary about how people celebrate a wedding, the family members drinking as they would in just about any event of its kind. This looks like a group that seem as close and friendly as you would hope to have in your neighborhood. But when a kidnapping occurs, fissions become active, leading to fights involving Antonio (Ramón Barea), the elderly father of Laura (Penélope Cruz), who is said to have gambled away his share of the vineyard. Imagine yourself at a large wedding, a friend of the bride who has only a faint idea of the guests invited by the groom. This is the situation you’ll find yourself in while watching the celebration. Allow some time to figure out who is married to whom, who may have fathered someone outside of marriage, who is the young man flirting with the young woman, and then some. After a half hour or so, you’ll get an idea of how everyone fits in, especially the situations of Laura and her husband Alejandro (Ricardo Darín), who spend most of their time in Buenos Aires and travel up to Madrid only for special occasions and brief visits. Some of the principals are afflicted with problems of their own making. Old man Antonio—Laura’s father, remember?—is a drunk who lost his land. Alejandro is a friend of the bottle as well and is unemployed, having gone to Germany to look for a job without success. Paco has a secret life that everyone in the small community knows about. The kidnapping of high-spirited Irene (Carla Campra), a teen who is drugged at the celebration and kidnapped by what looks like an inside job, is employed by writer-director Farhadi to turn the movie a psychological thriller while at the same time the crime is a catalyst to expose the family secrets. Some of the action borders on soap opera, but a more refined soap than you get on the afternoon TV shows here. When you think about the crime, you try to guess who from the wedding is involved. When you think about the families, you’re in the sphere, of course, of family drama. Dysfunction abounds. The crime aspects are gripping, enough so that you’ll barely notice that two and one-quarter hours have passed since you watched the opening credits amid the background of a church bell tower. Penélope Cruz and Javier Bardem have the chemistry you’d expect from two first-grade actors who in real life are married to each other since 2010 (two children), while the entire ensemble portray their qualities in a flawless fashion. The two principals aside, there’s little doubt that “Everybody Knows” is an ensemble piece, eminently watchable, allowing us to project our own lives into the bittersweet muddle that comprise this fine drama.